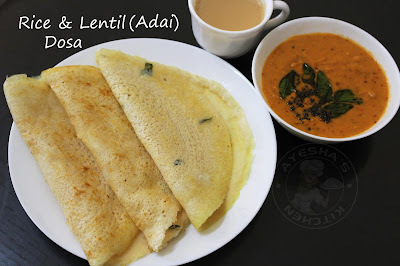 An adai dosa is a dosa like crepes prepared from a combination of lentils namely black gram (urad dal), split red lentil (masoor dal), split bengal gram(chana dal) and like so. No fermentation is required for this adai recipe. We can make a quite different varieties of Indian dishes with these rich lentils. 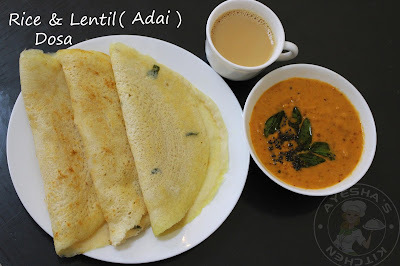 Soups, breads, dosa / crepes / pancakes, stir fries, desserts like payasam, kichidi are some dishes made with lentils. As these lentils and grams are rich source of proteins, it is too good to include those in our diet. Dosa with various lentils / dal is the best way to include this protein in our daily diet. Kids and adults equally loves to have this pancake / crepes for breakfast accompanied with some chutney or aviyal. Do try this recipe and let me know how this turns out for you.. Please drop your valuable comments in the comment box below. For a SPICY DOSA version you can add few green chilies, dried red chilies, cumin seeds, ginger, pepper powder and shallots while you grinding the soaked rice and lentils. It tastes nice, but my kid loves simple dosa without any spices. So i skipped adding those ingredients. Wash the rice and lentils / dal well separately and soak them for 3 hours in a separate bowls. When done, drain the water and coarse grind the rice dal mixture by adding little water. Now add water little by little and make a not too thick nor too thin batter. The batter should be slightly runny but not more. To this add, finely chopped onion / shallots, hing and chopped curry leaves along with some salt to the batter. Mix well and set aside. Now like masala dosa .....heat a dosa pan and grease it with oil if required only. For non stick pan, no need of applying oil. Once the pan is hot, make the flame to medium low and add a ladle full of batter. Spread it with the back of the ladle in a circular motion. After a minute, drizzle few drops of oil in the center and around the edges. Flip the dosa when that side is cooked. Cook the other side for few minutes.